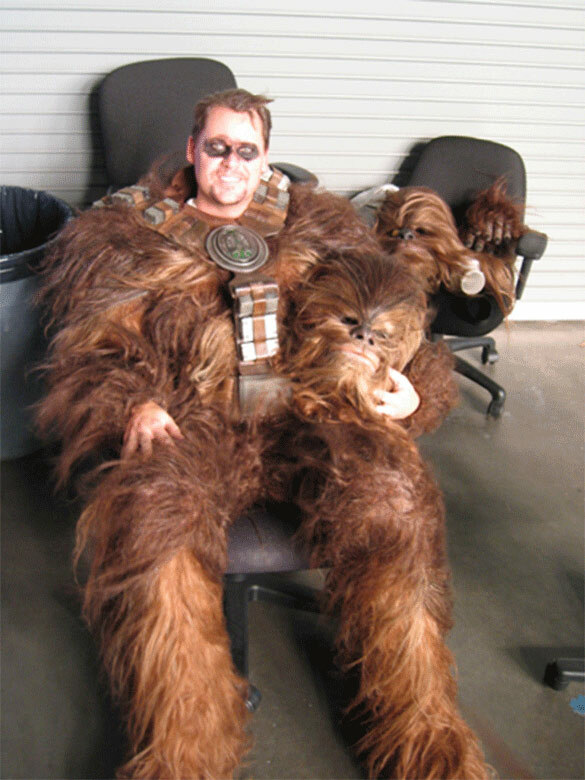 During the post production of Star Wars: Revenge of the Sith, I had the opportunity as an employee of Industrial Light + Magic to live my dream and become a wookie! Well, it is kinda silly to say that it was a dream of mine, but since I was 9 years old, I, like many others of my generation, was affected by Star Wars in one way or another. For me, it has meant that I’ve spent many years teaching myself the skills necessary and traveling cross-country to work for a company which has produced the images of inspiration during my childhood. When I heard that a new trilogy was going to be produced I had hoped that I would have the chance to work on them. But fate or some crazy star alignment or just some damn good luck allowed me to end up at ILM and I’ve been fortunate enough (some may snicker based on what they feel about the movies) to work on ‘Attack of the Clones and ‘Revenge of the Sith’. As a Creature Technical Director, I’m able to add dynamics to flesh, fur, cloth, build the inner skeletons (rigs) of creatures and make sure their skin envelopes and deforms properly, and blow things up with rigid simulations (particularly satisfying). I also get the opportunity to work with extremely talented and friendly people which is by far the best asset of ILM. 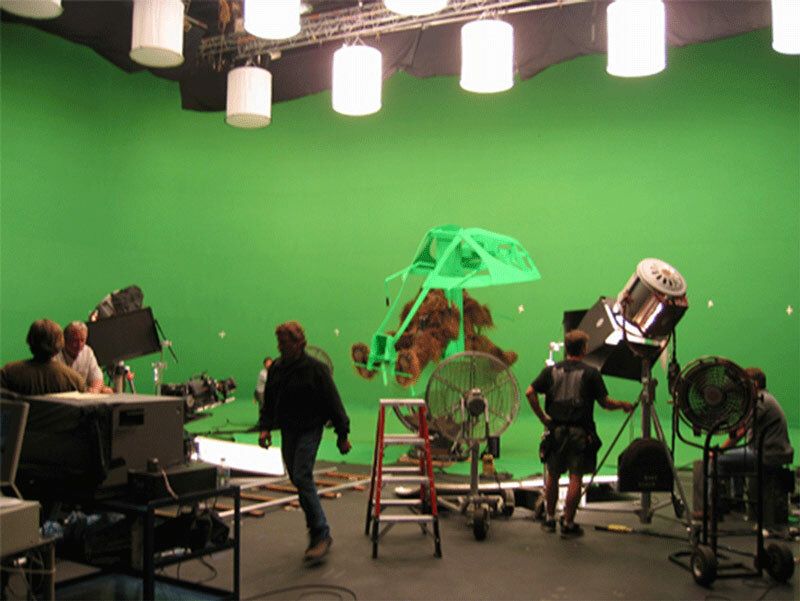 As an employee, we used to get the opportunity to don costumes and act as doubles and background characters (to fill out shots) which are filmed over “green screens” and composited into the final scene, usually so small and insignificant that the only people who know are ourselves! But that’s fine, it’s a thrill to be on set and see some of the true magicians in our field, the traditional and stage artists who really are amazing. The main shots of the wookiee copter firing during the battle of Kashyyyk took the morning and the beginning of the afternoon (I counted 46 takes!) to film. Since he was taller (and could reach the pedals of the greenscreen-colored copter) James drew the seat of the gunner (and the most screen-time!). I’m the driver… you know, so I got that going for me and all! Actually the copters handle pretty well, much better than a standard repulsorlift! 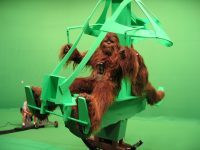 There was also an establishing copter shot filmed of the wookiee copter flying past the tree where Yoda and Chewbacca are “talking” but was cut for some reason and finished digitally. 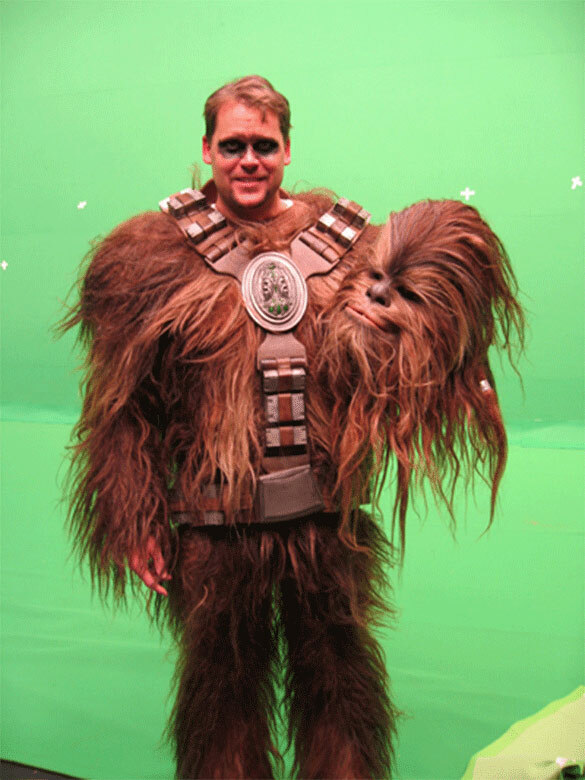 I covered my bets with that one though and ran the hair simulations on the digital wookiees! 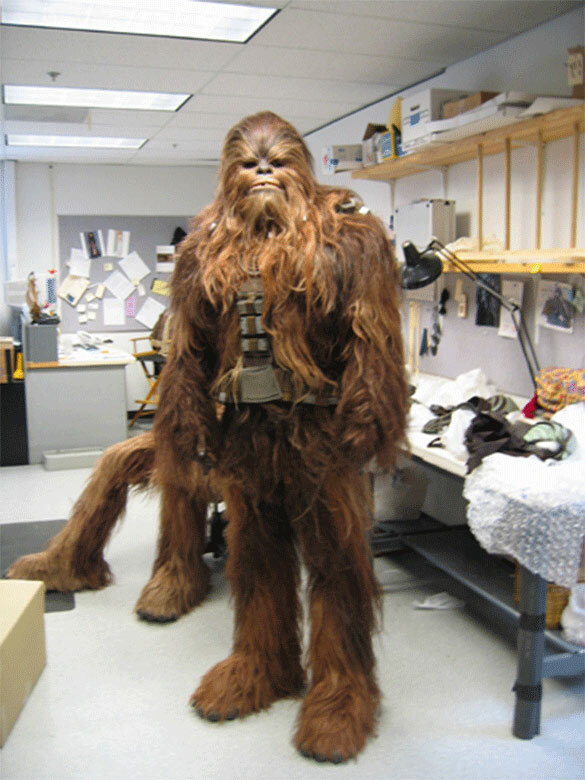 You got to see alot more of me in that shot, and the stage director that day was pleased with my wookiee “growling”. Sadly, that shot won’t be seen and I was left on the cutting room floor…. I also played a “dead” wookiee which took all the acting skills I could muster to pull off. James actually fell asleep in his costume during the filming of his “dead” shot. 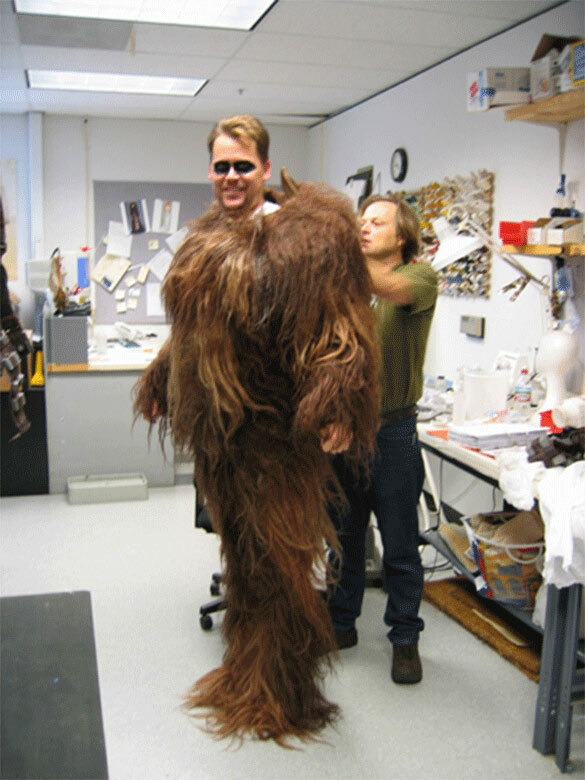 (some on-set gossip to share).Â I also was a mocap actor for the digital wookiee that comes to meet Yoda when he lands at Coruscant.Â Yup, that’s me walking! It was an incredible experience and although if you blink during the movie you’ll probably miss me, I don’t care! Just wearing the costume, I felt in my own insignificant way, the history and awe that Star Wars has had on my life.